In Microsoft Edge browser, with default settings, when you try to close a window containing two or more tabs, the browser displays a confirmation dialog asking you if you want to close all open tabs in that window. This confirmation dialog helps you avoid accidentally closing all open tabs at once. As you can see in the picture, the dialog also offers an option called “Always close all tabs” which when selected will not show the confirmation prompt while attempting to close an Edge window with two or more tabs. If you have configured the Edge browser not to show the above confirmation dialog, Edge will immediately close the window (all tabs in that window) without showing the prompt. While this will help you to close the browser quickly, you might accidentally close an Edge window. If you ever accidentally selected the option to turn off the prompt and want to enable the prompt now, there is not an easy way to enable it again. The problem is that there is no option under Edge settings to re-enable this “Do you want to close all tabs?” prompt. For some reason, Edge browser yet to get an option to toggle “Do you want to close all tabs?” prompt. That said, you can use the Registry to re-enable the prompt in Edge in Windows 10. 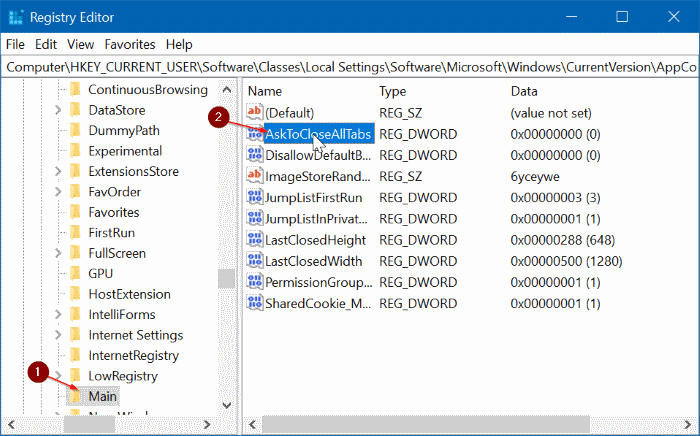 Here is how to re-enable “Do you want to close all tabs?” prompt in Edge browser in Windows 10. Step 1: Open the Registry Editor. 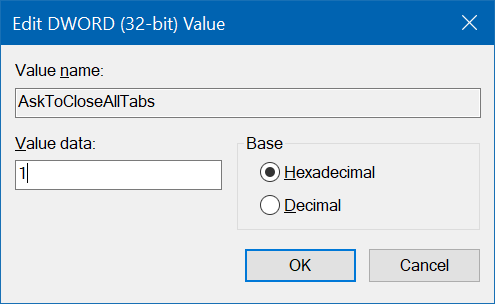 To do that, type Regedit.exe in the Start/taskbar search field and then press Enter key. Click the Yes button if you get the User Account Control screen. Step 3: On the right-side, double-click on AskToCloseAllTabs value and then change the value data to 1 to enable the “Do you want to close all tabs?” prompt. Click OK button. You may now close the Registry Editor. You should now get the prompt when you try to a close a window with two or more tabs. If not, restart the Edge browser once. If you are experiencing issues, refer to our how to repair the Edge browser in Windows 10.